With closing arguments scheduled for today, the long running Apple v. Samsung patent suit might finally have run its course. Like a once popular television show that has jumped the shark, the court proceedings no longer seem to bring up the same emotions they did back in 2011 when the original trial started. Samsung's guilt is no longer a question, and what is being decided is the amount of the check that Sammy sends to Apple. What is being decided is the definition of an article of manufacture. Does Samsung owe Apple based on the revenue it earned from selling handsets that used Apple's patents sans permission? Or, should the damages be a small percentage of the total revenue, based only on the value of the design infringed on by Samsung. In broader terms, should the judgment be computed based on total sales of the infringing product, or a small percentage of that amount based only on the component used without obtaining a license? Last month, Judge Lucy Koh said that the burden is on Apple to prove that that an article of manufacture is a complete handset, and not just a component. The jury in the original trial, which awarded Apple more than $1 billion, heard improper jury instructions and never knew that an article of manufacture could be anything but an entire phone. Judge Koh said that the result was a jury that was biased against Samsung. Over the years, the original judgment was whittled down. With the closing arguments marking the end of the current legal proceedings, we should know how much Apple will receive from Samsung very soon. The former is looking for $1 billion and the latter wants the final judgment to be no more than $28 million. Everybody copy everything , totally normal Apple copied HTC's back design Samsung copied apple's front design Xiaomi copied apple's glass back Apple copied the essential's notch ... I'm will argue with anyone , about anything. 28 mil is not even enough to cover 2 party legal expenses. Even $100 are too much for such stupid and impertinent Apple's demand. Actually Apple must pay $28 mill to Samsung for the troubles and image damages. The damages need to be well below $100 million. Do you mean the damages that Apple should pay to Samsung? No, that's not what a meant. Vivo very popular in countries like India launched phones with notch on top much ahead of Apple... But still talk of it as Apple invention.. The notch is not a thing that one should brag with! It's a disaster! Especially the way Apple implemented it. Except of, if the notch is hidden whit a black stripe all of the time, like a whole thin bezel, and only the icons are seen on it. I don't care who implemented it or how they did it, they should be required to advertise the usable screen size (minus the ears). Advertising the size including them is deceptive. Exactly! ' they should advertise the usable screen size ONLY (minus the ears) But the Notch to be welcome, the 'ears' should never been seen. Only the icons. Then it will be nice little feature. this trial shouldve been apple vs multiple android oems, not just samsung...if apple dont include the other android oems, this trial should be dropped. Hopefully Samsung will be made an example of. They have already proven themselves to be a corrupt and morally dubious company. Apple should be awarded max damages. If there's any justice, Apple will be awarded fast less than they spent on legal fees for this sham case. This whole suing thing is just ridiculous. Glad that it's over soon. Apple would be screwed if Essential had the same approach to things as them. "Apple would be screwed if Essential had the same approach to things as them" The first iPhone X schematics which depicted a notch were leaked in April 2017. Before that, we had seen a single photo of the Essential PH-1...a photo which showed nothing except the top corner of the display. A photo which DID NOT include the Essential's notch, because it was covered by a hand. You guys can keep hoping and praying that Apple copied Essential, but...they didn't. It's time to let it go. Stop defending the rotten Apple. We all know who copied who. Who cares. Samsung got what they wanted. Completely changed their design to copy apples and got an OS handed to them until they could stand up in the early smartphone competition long enough to figure it out. They all copy each other in a mature environment now. Just business. You've completely revised history in your mind just to rationalize Apple doing most of the copying today. Samsung were making smartphones LOOOOOOONG before Apple got in the game, and we're competing just fine, and arrived at the F700 design at the same time as Apple (both after LG with the Prada). Apple weren't in the early smartphone competition. Samsung was. Samsung just copied the other at the time (palm, BB, htc) and then moved on to copying Apple once Apple changed the game- they didn’t even try to hide it. The f700 was a rushed product that didn’t sell and still tried to copy. Now that they are stable they have differentiated themselves a tiny bit but to say they didn’t shamelessly copy everything they could from Apple is just silly. Again, you're revising history on the fly to fit your worldview. The only silly commentary here is yours. 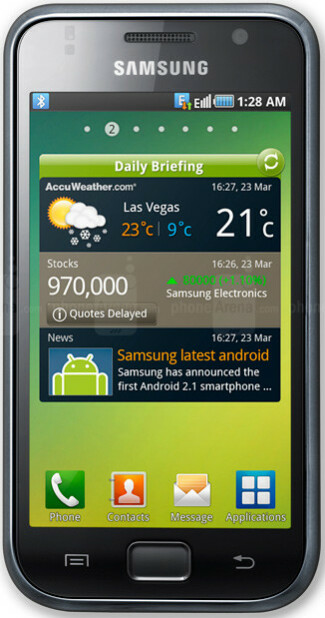 The F700 design came out concurrently with the iPhone design. But, fine, let's play your game. The iphone was just a rushed product copying the Prada. Of course, that's not true. The fact is that smartphones were heading in this direction all along, because the general public were going to use the as media consumption devices.. Therefore, the natural course for development was for a rectal rectangle device with a screen dominating the face. LG, Samsung and Apple all saw this trend, and all designed phones in this direction at the same time. I'm not understanding this argument... Aren't we supposed to sue when we lose money from patent infringement? What money has Apple lost to Samsung? Isn't Apple already pricing $300 phones in the $1300 range? Apple has more than it's fair share of money... They need to stop. And let's not forget how they did a 180 on their original spiel. Every new iOS feature is from Android, Samsung, LG and HTC.